Over the next few weeks on Facebook and my Website I will be looking at the things you can do each day to create a life that you love. I will encourage you to make conscious choices through a daily and weekly routine, next-action to-do list and reminders on your phone in an effort to move away from “I’m so busy” and towards a simpler life that you love. The key to a successful day (and a life that you love) is a well thought out routine. I’ve previously explained that for busy families a morning routine clearly outlines who is responsible for each task, at what time and, most importantly, the time you are expected to head out the door each day. Follow this link for an Example Morning & Afternoon Routine. But today, I’m going to concentrate on creating a daily routine for you! What do you need to do each day to create a life you love? Make important things a healthy habit that you don’t need to think about to free up brainspace for more important things. Consider the list below (and others that are important to you) and schedule time in your diary for each one that is relevant to you. I cook delicious dinners for the family (need help with this one, have another look at meal planning here). I am up to date with the washing and other household chores. Now that you’ve consciously chosen how you want your life to look and what you need to do for it to look that way, put it in the diary. Schedule a time each day (or weekly, or monthly) to do what you need to do and do it! Creating healthy habits and making them a part of your daily routine may take some work initially, but these new habits will become easy over time with a bit of persistence and will be well worth the effort. Next week we will take this routine one step further and set up reminders in your phone to keep you on track. 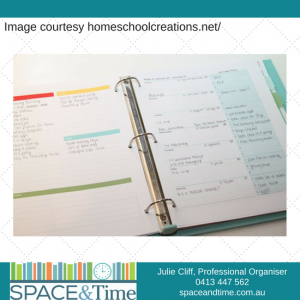 Need a hand creating a daily routine that includes healthy habits, then check out my Time Management Services or Contact me today for a chat about how small regular changes can help you create a life you love..